Location intelligence platforms often feel overwhelming in practice, so Cuebiq turned to Rule29 to tell their story in a way that makes their message clear and accessible. To introduce their location intelligence database, we wanted to create a brand that was refined while merging seamlessly with the current Cuebiq branding. Our research showed that in a tech-centered ecosystem, it would be important to incorporate elements that were friendly and approachable yet modern and sophisticated in implementation. 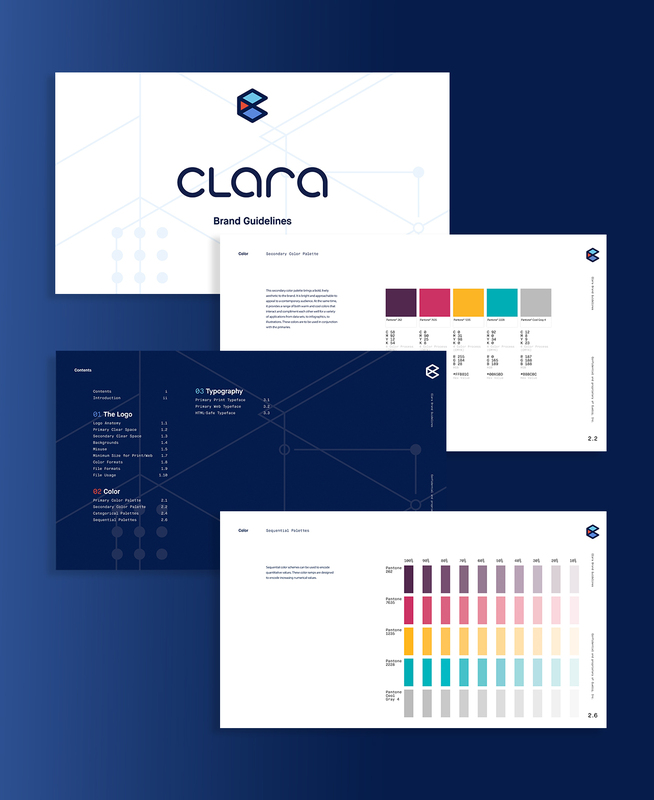 Getting in on the ground floor of the Clara branding gave us to the opportunity to explore color variations and palettes. The amount of data charts and graphs required a wide variety of secondary and tertiary color palettes. To ensure they were on brand, we created nearly 17 different color sets. Working with Rule29 is refreshing—they’re transparent and easy to work with. The marketing and branding services helped unify the new product with the established business. Updates to the site contributed to an increase in online engagement and customer interest. The team at Rule29 has shown dedication to producing quality work that surpasses expectations. 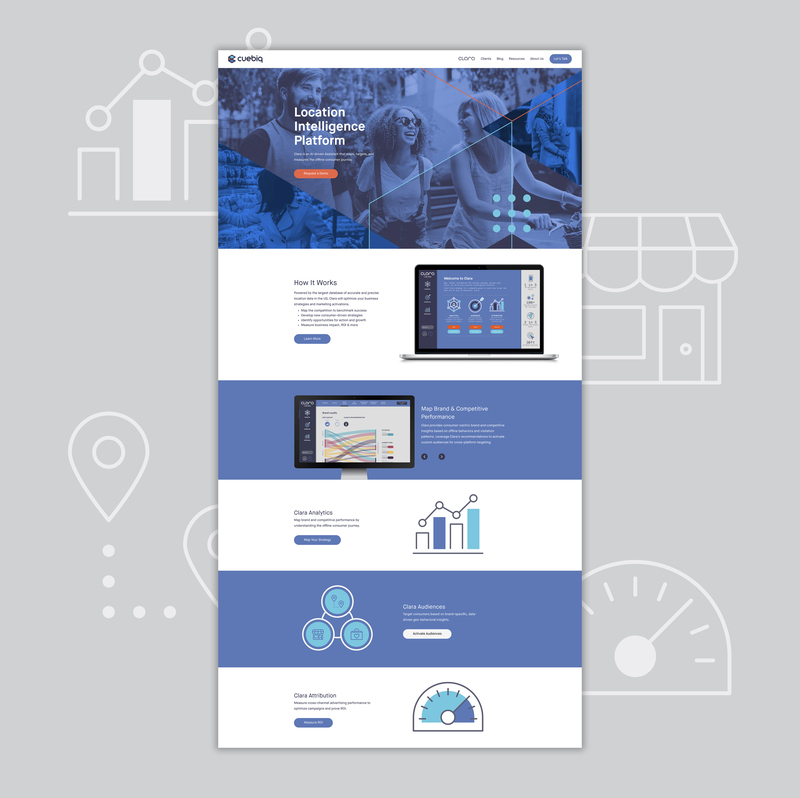 When it came to redesigning their homepage, we knew we wanted to emphasize Cuebiq’s data-driven platform by using eye-catching callouts and interactivity. As the user moves down the page, illustrations animate in alongside explanatory text to provide the full picture of their product. The movement was designed to create an experience that is both informative and entertaining to retain engagement of readers. 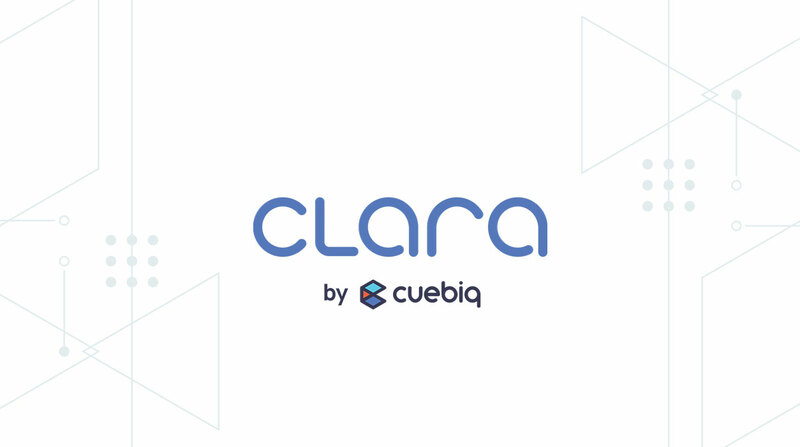 This magazine ad features imagery as the focal point to connect to the end goal for the Clara product. Additional line elements are reminiscent of target-mapping and data-driven approach. A lot of the iconography found within the Cuebiq brand takes a story-based approach to boil down information which allows the Cuebiq sales team to establish moments of emphasis no matter the presentation setting. To offer consistency and cohesion, we created banner ads that follow the Cuebiq brand iconography and styling similarly to what is found on their one-sheets and presentation materials. These custom icons were designed for key subject points within the Cuebiq brand and can be used throughout their materials internally or externally. The Cuebiq team creates a lot of compelling thought leadership and white paper items to continue to educate the public on their product, but these were spread out throughout their site and not easy to find. 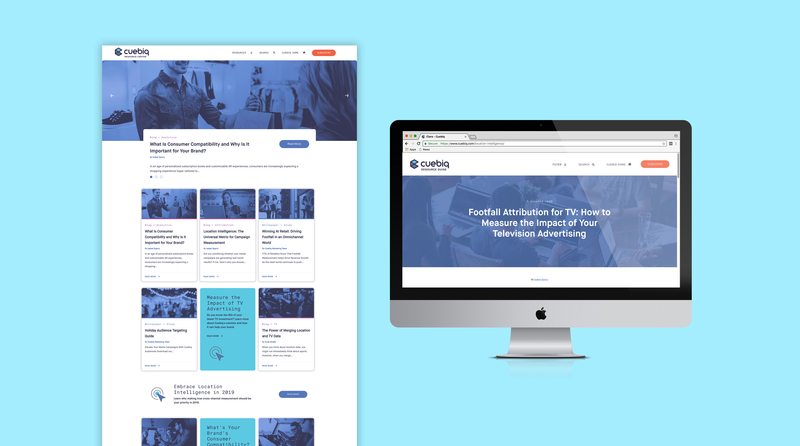 We created one centralized location to house all Cuebiq stories, with a built-in RSS feed of related media sources to provide a highly functional Resource Center with rapidly changing content. The Cuebiq team can update content when necessary, providing a consistent element of change on the site for repeat visitors.